The Glacier Bay 18.6 in. 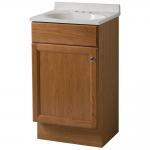 oak vanity combo with white vanity top has classic styling that will complement a wide variety of bath decor. 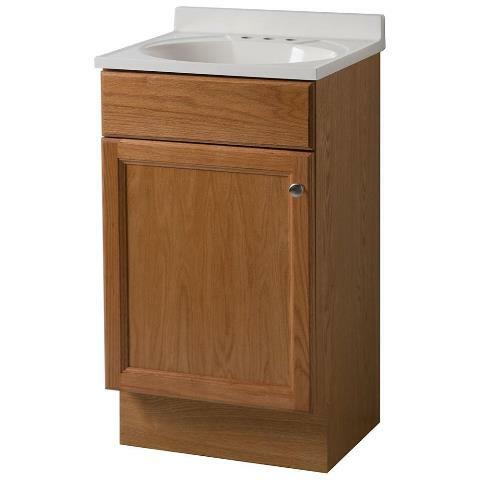 Featuring solid oak and veneer fronts, this cabinet has a white cultured marble vanity top with an integral oval bowl and is pre-drilled for a 4 in. centerset faucet. Vanity is accented with brushed nickel cabinet hardware. The perfect fit for small spaces.